State association recognizes Hamilton teacher - Hamilton School District. 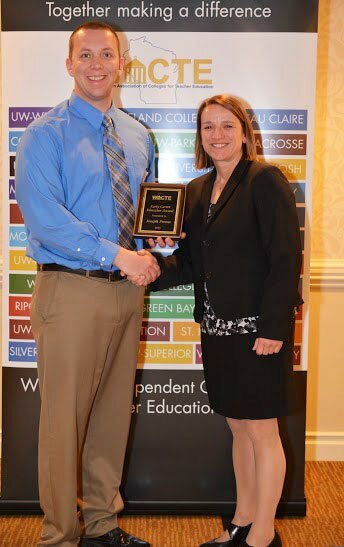 The Wisconsin Association of Colleges for Teacher Education recognized Hamilton High School teacher Joseph Premo as an outstanding Early Career Educator at its recent awards ceremony in Madison. Premo, an applied technology and engineering teacher in the Hamilton School District since August of 2012, was recognized for encouraging his students to be lifelong learners and making connections with community leaders in business, education and industry. He was one of 23 Early Career Educator Award winners chosen statewide based on the positive impact they have on schools or communities, innovative learning experiences and advocacy for students. The award is presented to outstanding educators within the first three years of their professional career.